Buba seems to have just been curious about the world outside his circus life ... or perhaps he was lonely. Elephants are highly social animals, and in the wild they live in strong family structures. But Buba lives a life surrounded by humans and loud noises and flashing lights — no wonder he tried to get away for a bit. More and more circuses are bowing to public outcry and retiring their performing elephants. Forcing elephants to do tricks often requires abusive training and using a bull-hook, a painful tool, to direct them. Things will soon be changing for Buba, though. The Netherlands recently banned the use of exotic animals in circuses, and that ban goes into effect September 2015. 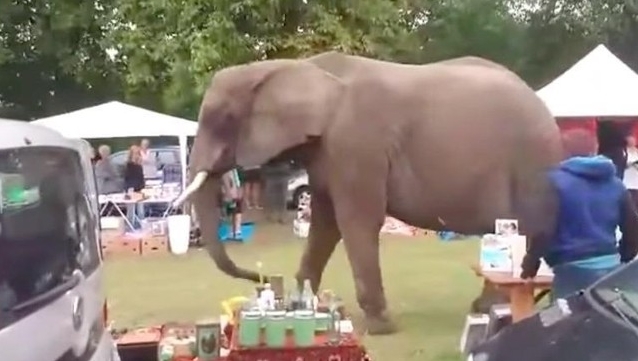 Responses to "Lonely Elephant Escapes Circus, Just Wants To Explore Flea Market "
ELEPHANTS SHOULD NEVER BE USED AND ABUSED LIKE THIS!!! What will happen to Buba in Sept? I love him. So gentle. Just wanting to enjoy himself, explore the world.